You see, I always had a hard time reconciling the idea that you should set goals in all areas of your life to be balanced, yet you should only focus on one thing at a time to really get it done! What was I supposed to do with all those other goals and plans? It seems to me I would always be in a state of focused imbalance, if I followed conventional wisdom. That’s when I started to develop the process you find detailed in today’s post. It’s based on strategy development techniques used in the business world, as well as in sports and by the military. One of my favorite ways to do this is with mind mapping. It allows for non-linear thoughts to be captured without having to worry about overall organization of information. I prefer to mind map on paper or a white board, but if you prefer electrons, see this article. This is, by far, my longest post ever. However it is super-critical so I created a bonus for you, to help you out. To receive it, just click here. It is a companion guide with several examples so you can see it in action and get your own creative juices flowing. Start with a blank sheet of paper and draw a smiley face in the middle. This is you :o). Draw four spikes with circles on the end (no need for a straightedge and circle template, this is a creative process!) and label them career, mother, partner and self-care. Radiating off the self-care circle, draw four lines with circles and label them physical, mental, social/emotional, and spiritual. Follow the “I” with an action verb. State them as if you have already accomplished them. Write them in the positive. Moving toward something instead of away from something. Now, on your mind map, circle or highlight just one from each area that represents your highest priority right now. We’ll design these seven in Step 2. For the non-selected goals, I want you to write down one small thing you can do to move that goal incrementally forward over the next 3 months. For example, if your non-selected physical goal is “I eat healthy”, then your incremental step might be “I only drink water with my meals”. I like to call these the +1 things because they only make small changes. This helps calm the panic your brain feels when having to choose between two important things. Your brain can relax knowing you are doing something to move the needle on your other goal! What excuses are you likely to make? When will you make those excuses? Relax. We are about to make life simpler. I want you to choose one goal from the self-care area, and another from any of the other areas to concentrate on for the next three months. Just two. That’s it. In three months, we’ll move on to another pair. By the end of the year, we’ll have hit all of them. I like to narrow down to two goals at this point because Step 2 usually drives home what’s really important. Plus, Step 3 is wasted if you won’t execute for 3-9 months and who has time to waste? But we do have to calm that brain. So once again, for the 5 goals we are postponing, write down one small +1 thing you can do consistently to keep heading in the right direction. In this step, we build on the foundation laid in Step 2 and create plans for our two near-term goals using mind mapping again. get the knowledge and skills I need? get the support and help I need? get the equipment I need? make the time to do this? get the money to do this? give up something or rearrange my schedule to do this? Once you feel your list is fairly complete, go ahead and logically sequence and prioritize them. I just usually go around my mind map and put little numbers by things. When you’re satisfied, now is the time to write down your steps in either a project plan or a checklist, depending on the complexity. You may notice that there are recurring things on your list; things you have to do daily, weekly or monthly to reach your goal. That’s OK. We are going to deal with all of them AND all your +1 things from Steps 1 & 2 now. You can modify the letter if you need to. For instance, if something isn’t daily, but you do want to do it two times per week, use 2X/W. Time for more lists. Label three separate sheets of paper with Daily, Weekly and Monthly. Go through all the items from Step 1’s +1 activities, Step 2’s +1 activities and from your plans created in Step 3. List them on the appropriate sheet. It’s that simple and it’s that liberating. The one thing our brain was NOT created to do was remember lists. We have freed your brain from this burden! The time you spend now will be returned to you at least 10X in monthly, weekly and daily planning. All because you have lists already created with your most important things on them! Having all your goals in this strategy doesn’t amount to a hill of beans if you don’t execute it. Execution happens in…you guessed it…monthly, weekly and daily planning. But the good news is that all this up front work makes all the other planning a snap! If the daily lists look overwhelming, apply the Most Important Thing (MIT) strategy. What is THE most important thing on that list? The second MIT? And so on. Once it’s prioritized, tackle the #1 MIT first. Then, if the day gets away from you (and God knows they do! ), you’ve at least done the Most Important Thing! One thing I like to do for a few of the daily to-dos, is track them on a small calendar. I just color in that day when I do that thing (for me, it’s taking my vitamins). I get on these streaks and all of a sudden, I don’t want to break the streak, so I just keep remembering to take my vitamins! When it becomes a habit I do without much thought, I move on to the next item I want to track. Last but not least, is the quarterly review. After 90 days of working on a goal pretty diligently, look back at your plan from Step 3 and see how you are doing. If many of the steps are in place and you’re satisfied, feel free to do Steps 3 and 4 for another of your goals from Step 2. If your goal needs more care and feeding, feel free to work on it for another 90 days; the whole point was to work on two goals that are very important to you! I know this seems like such a loooonnnnggg process, but you do gain that time back tenfold, I promise. I’ve been using (and tweaking it) for years, and managed to do a lot of cool things without losing my sanity (or my job…or my husband…or my kids’ respect…). I’m very excited this week to introduce you to the new STEMinista Logo! Thanks to a nice Brazilian designer I found on fiverr, I was able to get the design done in just a few days. I personally think it is very eye-catching, but more than that, it has meaning. STEM professionals in general aren’t into symbolism much. But I put on my Da Vinci Code hat, stretched out of my comfort zone, and got it done. But, together, we got it right! First of all, I wanted something with an overall techie theme, hence the atom. But it had to be feminine, so that drove the color choice. Oh, I know it’s stereotypical, but a deeper toned hot pink appealed to me! Especially with the hombre effect added. Next came the “orbital paths”. Notice that there are three of them. They represent your career, your family, and your partner. Sound familiar? They should! In my definition of a STEMinista, they are three of the four areas that a STEMinista wants to rock in! Which brings me to the fourth area – self care. That’s the nucleus and that’s you. If you don’t take proper care of yourself, you can’t be your best at your job, for your kids and your partner. You are the gear that makes all that work, so that is why there is a gear surrounding the nucleus. Voila! The new STEMinista Revolution Logo! If there was one lesson I learned, it was to bring in help for the areas where I’m not particularly skilled. I’m sure I could have come up with something, given enough time. But why waste my energy? I would have had to research the correct software to use and learn how to use it, all before I even started designing anything. A far better use of my time and a few dollars was hiring that out. So I did, and I’m more than pleased with the result. Just for fun: Love is like pi: natural, irrational, and very important! What if they think I’m rude? Who am I to deny them this happiness? Yet in today’s very noisy and distracting world, saying no is an absolute skill we must master. After all, one of the first ways to reduce the amount on our plates, is to stop adding to our plates. That requires us to <gulp> say no to some of the “opportunities” that come our way. When my daughter was in high school, I coached her FIRST Robotics Team. I enjoyed it, so after she graduated, I stayed with the team for another two years. Then I caught the entrepreneurial bug and started my own business. With a full time job, a husband, two kids, a house and a cabin to maintain – I was BBBBBUUUUUSSSSSYYYYY. If I wanted to have a side gig, something would have to go. So I gave up coaching the robotics team. I had to say no when they asked if I was going to continue into the next season. It was hard. I had genuinely enjoyed it. But something had to go if I was going to add running a business to my plate. No: What Makes It Easier? In order to say no without all the internal angst, you should have a bigger YES inside of you. When your boss asks you to work on the Christmas party committee despite the November deadline on your biggest project. When super-helpful Mrs. Jones asks you to bring in two dozen cupcakes to little Johnny’s class and you have a Little League double header the night before. Everyone knows that everyone is busy, but no one knows what’s on your plate already when they ask you to add something to it. Let out your breath in a whoosh. Realize that “No” is a complete sentence. You don’t have to add any reason or excuse after it if you don’t want to. Most of us want to. Do you realize what that does? It opens you up to negotiation. Crap. You really didn’t want to bake cupcakes EVER, yet now your excuse is mitigated. Don’t get into the excuse game. Everyone knows that everyone is busy and you’ve just set a boundary. If the relationship is important to you, you want to preserve that, while still not committing to their request. Now that you’re armed with some tools, what are you going to say “no” to this week? It doesn’t have to be big and hairy, as long as you start practicing to master this skill! The STEMinista Revolution Consists Of…What? It’s all well and good to start a revolution (if not a little terrifying) but what does it mean? I do not want to burn my bras. Do you know how expensive a quality bra is? And who wants to bounce anyway? Revolutionaries are generally very angry. And very violent. I don’t want to be either of those things. So I’m approaching this from the other side. More of a Ghandi-esque approach. As I claimed in last week’s post, Starting a Revolution, a STEMinista is a woman with a STEM career that is devoted to rocking it in all areas of her life – career, mother, wife – even self-care. We have enough to do without protests. There’s not enough time in the day to get and remain angry. But we do need to acknowledge those women who came before us. They are largely the reason that colleges started accepting women to their tech programs. Their in-your-face style was what was needed at the time and this is a fascinating (and short) documentary on the women’s movement of the 1960s and 1970s. Thank you, ladies. You are owed our debt of gratitude for your courage and bravery. And we will continue to carry the torch. But now it’s going to be a little different. Now, we have the internet and social media. I want to create a revolutionary community where knowledge is power. A place where honesty prevails and support is the right of every revolutionist. I’ll be writing a weekly blog that provides insight into the roles we play. These blogs are informed by research studies, videos, articles and my own life. They will also have a dash of humor, as I can’t resist! The web site, coryneforest.com, will have links to articles and other information borne of the internet on the subjects that matter most to a STEMinista. Not every STEM woman will want to join and that’s fine. But I do want to shine light on some reasons I’ve heard. If I want to be seen as an equal, I shouldn’t do things that divide us. True. But joining a group of STEM women engaged in educating and supporting each other doesn’t have to be divisive. Men are welcome to join, too. The first rule of diversity is “you don’t have to be one of to stand with.” Invite your male STEM professionals! Their voice is welcome. Women who get together around causes just b!tch and complain. Nothing changes. Sometimes true, but sometimes cathartic. My vision is to change the landscape in the tech professions. The entire revolution is to get STEM women to stay in their careers by providing guidance, advice, and support. That’s a change and change only happens through action. In order for my vision to become reality, we women need to suppport each other on this journey. Share the wisdom you’ve gained. Get help from other like-minded people; surround yourself with people who want you to succeed. No bull horns and picket signs here. Just the internet and a something to connect you to it. Watch and see. You’ll be amazed at what we can do when we band together – even virtually! Just for Fun: Watch the old Enjoli perfume commercial! 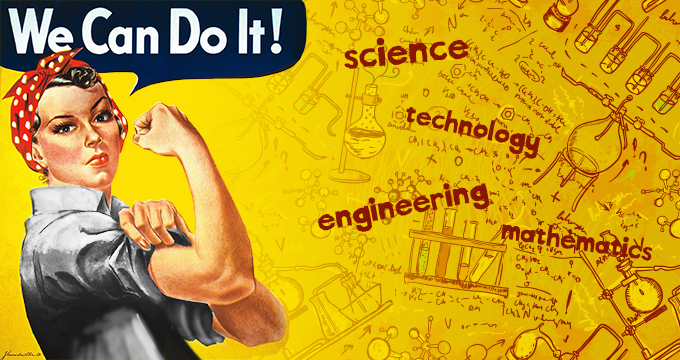 STEMinista – Starting a Revolution! We Can Do It! STEM Career, Spouse, Kids, Health! I’ve decided to be defiant and start a movement I’m calling the STEMinista Revolution! STEM + Fashionista + Feminist = STEMinista! A STEMinista is a woman with a STEM career that is devoted to rocking it in all areas of her life – career, mother, wife – even self-care! I decided to take this revolutionary step (see what I did there?) because women are still struggling too much in the tech professions and something has to change. When I started my engineering career, women were just entering the tech professions. I wasn’t a pioneer by any means, but the number of females pursuing tech degrees was pretty low. In my freshman class at (now) Kettering University, there were 24 girls and 124 guys. Because this was the first wave of women entering the tech workforce, I expected that I wouldn’t find many (or any) women in senior positions to use as role models. I was right. Flash forward 25 years, and the numbers are still pretty dismal. My excuse was that it takes time for women to work their way through the system and gain experience to become senior tech professionals and leaders. Well, they’ve had the time and they’ve gotten the experience. After two and a half decades, that excuse doesn’t hold water anymore. What is happening to the women? I’ve been studying that question and interviewing a lot of women to find an answer. You guessed it…there isn’t AN answer. It’s complicated. In the past, I’ve posted about the work environment tech women are experiencing and also about the societal norms that are putting tech women in a pressure cooker. The bottom line is that women are buckling under the pressure of career, family (spouse and children mostly) and trying to take care of themselves so they can juggle the rest of it. Enter the STEMinista Revolution. It isn’t just for the women who have it all together already (although, God Bless You if you exist!). It’s for the women who don’t want to throw in the towel just yet on any aspect of their life. enough vitality to enjoy your life? That’s what being a STEMinista is all about. My vision is pretty simple. I want a changed landscape in the tech professions, where women are in senior positions and ROCKIN‘ it in all aspects of their life! How am I going to make my vision a reality? By banding STEMinistas together to support, encourage, and educate each other, so no one gives up. So, will you join me in the revolution?